Drivers sitting in gridlocked traffic stare at the “empty” bike lane, because I have already long passed them. 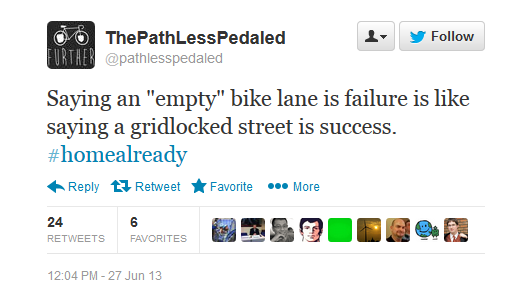 Great quote by @pathlesspedaled. The empty bike lane shows most humans not being able to compute the available information: Why am I here in a car? if I use a bike, I can use that lane, saving time, money and the environment. As an extra bonus I get some exercise.